How Many Children Did Job Have? Many times when helping people with life issues, I reference some of the things that Job went through. One area that surprises some people is how Job lost his children in a wind storm. If you work your way through the account, you find that Job learned many lessons along the way. I am sure that one of the hardest lessons he learned was the loss of his children and the rejection of his wife. 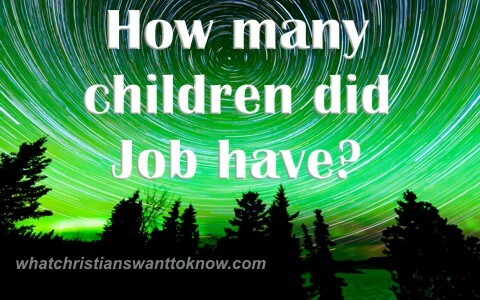 We will look at how many children Job had and how God ministered to him during this tragic time. What is the premise of the book of Job? The book of Job starts out by telling us that Job was “perfect and upright, and one that feared God, and eschewed evil” (Job 1:1). Referring to Job as perfect and upright and fearing God tells us that he had a relationship with God that went beyond religion. He was noted as also being a man of prayer. Of particular notice is the interaction with Satan that was found in Job 1:8-22. In this interaction, God asked Satan if had considered His servant, Job, followed by His description. Satan replied that the only reason that Job feared God was because God protected him and his house and blessed his work. Satan added that if Job’s substance was touched, that he would curse God to His face. God allowed Satan to torment Job, but not to attack his body. Depending on how you count it, you could say that Job had 14 sons and six daughters. This first attack had four parts. Jobs farm workers were attacked and killed. Fire from heaven killed the flocks of sheep and shepherds. Attackers took Job’s camels and killed their caretakers. And finally, the wind collapsed the house and killed Job’s children. The description literally said that the house “fell upon the young men” and they were dead (Job 1:19). At first, you would think that only the seven sons were killed as we know from Job 1:2 that he had seven sons and three daughters. However, in Job 1:18, we are told that the sons and the daughters were at the house of the oldest brother’s house. Job 1:19 has led many to speculate that it was only the seven sons killed, but it is common in Biblical descriptions to list the number of males, but not females (Numbers 1:1-3:43). Job’s reaction to all of this was extreme grief. However, in the process, he never sinned nor blamed God (Job 1:20-22). This eventually led to a second encounter with God and Satan with the same discussion only this time, God added that even if Satan moved against him without a cause to destroy Job. Satan responded by saying that if God allowed him to attack Job’s body, Job would curse God to His face. God allowed Satan to attack Job, but not to kill him. Satan attacked Job with boils all over his body so nasty that he had to scrape the scabs from his body with sharp pieces of broken pottery. To add insult to this attack, even Job’s wife said, “Dost thou still retain thy integrity? Curse God and die” (Job 2:9). Talk about being kicked when you are down! Needless to say, Job goes through a lot of soul searching, questioning of himself, bad advice from friends and acquaintances, and just an overall loathing of himself. God then essentially interrupts the pity party and bad counsel by speaking out of a whirlwind. He lectures Job on the ignorance of idiocy of their whole approach to these things. God explains that what has happened is not a humanly described problem, it is the result of Spiritual warfare (Job 41). When God finishes, Job speaks to God and acknowledges what God just said. He adds that He can see what God was saying and told God that he loathed himself and wanted to repent in dust and ashes (Job 42:1-6). It was then that God rebuked Job’s friends and sent them to make offerings for their sins. Job prayed for his friends and God responded by blessing him abundantly. We see a description of the blessing in Job 42:10-13. His loved ones came to comfort him and God blessed them all. God also restored Job’s flocks and blessed him with seven sons and three daughters. Depending on how you count it, you could say that Job had 14 sons and six daughters. However, with the loss of the first ten and replacement by ten more we can learn more from the story. You see, God not only gave Job more children, It is apparent that God also restored the relationship with Job and his wife to produce 10 more. This left Job with 10 children to cherish and raise in the nurture and admonition of the Lord. Job was a man that God described as perfect and upright, and one that feared God, and eschewed evil. He had 10 children, seven boys and three girls. Job lost his children when Satan attacked him. Through this attack and another, Job demonstrated that with a right relationship with God and relying on God’s strength, we can do all things through Christ, who strengthens us (Philippians 4:13). I don’t know how to put it but to my understanding children are gifts from God. Now chapter 42:verse 10 of NIV and KJV tells us God promises Job to be restored his fortunes and give him twice as much as he had before. So if you say Job had 14 children that’s will be as per the bible but if you go as per the simple english meaning for “twice” he should have owned 30 children. Seven sons and three daughters from as from chapter 1:2 of NIV and you then add twice the one God promised to restore which is 20 making the total 30 children. Job has 10 children, lost them, but they are not lost forever. They are waiting for him in the kingdom. God never said he doubled the number of childrne but that happened too. 10 plus 10 is 20. That’s doubled. I guess your confused by his next to last paragraph. He is saying that “you could say that Job had 14 sons and six daughters. However, with the loss of the first ten and replacement by ten more we can learn more from the story,” and that’s true because his children are not dead who died. God is the God of the livign and not the dead. I am sorr you didn’t like the article but found only problems from it. Next post: How Does The Bible Define Agape Love?